Filipino pro Lester Edoc continues amaze this year especially on home turf where he has already claimed three Main Event titles since February. The previous one was in April during the first edition of the ongoing APT series and nearly landed another APT major finishing runner-up at the Championships Event. Two days ago, he was back under the APT spotlight again for securing his first-ever CoinPoker Super High Rollers title. The event drew in 7 players each one coughing up the PHP500,000 buy-in (~US$9,200) with three of them firing a second bullet to make it 10 entries in total. Players in action were WSOP bracelet winner Mike Takayama, 2018 APPT Manila National winner Marc Rivera, Satoshi Ikeda, Andrew Nguyen, Kota Nakano, and Kirk Steele. Edoc dominated the final day with four players remaining. He eliminated all of his opponents starting with Nakano, Steele, then Rivera at heads up. This victory boosts his career earnings another PHP2,745,700 (~US$50,700). At the time of writing, Day 1A of the Main Event had already wrapped up with defending champion Edoc bagging up the second largest stack. Just as fueled up as Edoc was Japanese pro Iori Yogo. Yogo has racked up a long list of achievements this year with his latest (prior to the ongoing series) at APT Korea Incheon where he won the Main Event. Last night, he lifted up a side event trophy, besting the 47-entry field of the Pot Limit Omaha Hi Lo Split event. He earned PHP212,300 (~US$3,900). He also min-cashed at the opener for finishing 46th. This was a great start for Yogo who in the coming days will likely be defending his title at the Championships Event. The festival opened its doors with the APT-RWM Opening Event. This event extended a PHP2,000,000 guarantee but with 319 entries storming in, that ballooned to PHP3,094,300 (~US$57,100). Capturing his second-ever title was local player Julius Lagman. 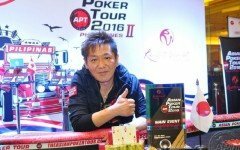 Lagman defeated Japanese player Ito Shinya at heads up to earn the PHP584,600 (~US$10,700) first prize. Interestingly, he won the APT opening event two years ago also at the same venue. The opener was a two-day affair with the locals dominating the final 8. All but runner-up Shinya was from the host country. One player giving Lagman a challenge for the gold was Alexis Lim. Lim has been piling in the scores since 2016 and even has an APT Main Event title under his belt. His run at the opener ended in a respectable 3rd place falling at the hands of Lagman. We will continue to follow the action of the APT Philippines Championships II 2018 so check back with us here at Somuchpoker.com for the updates.